← 441 "Coming to Homerica"
The Simpsons arrive at a subway station, where the subway doors open to reveal their living room. The class hamster isn't just sleeping. "I have a bad feeling about this movie. Our star's overweight, we're way over budget, and that grasshopper raptor we built seems to have developed a mind of its own." "Homer the Whopper" is the first episode of season 21. "Comic Book Guy's comic book hero, Everyman, becomes a big hit in Springfield, and he agrees to a movie version. CBG insists he choose who plays the lead role, and gives the part to Homer. However, the movie company hires a personal trainer for Homer, named Lyle, so he can get fit for the part. When Lyle leaves, Homer puts on weight again, and the movie is a disaster. The company offers CBG the chance to direct a sequel if he pretends he liked the movie, but he criticizes it." 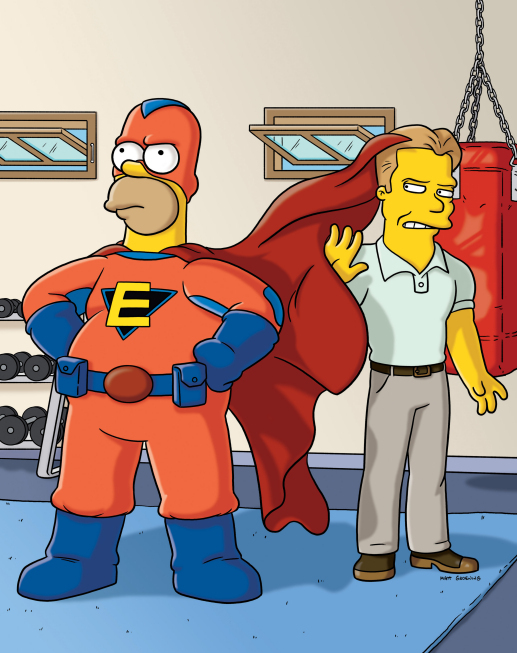 Bart and Milhouse convinced Comic Book Guy into publishing a comic book he wrote titled Everyman, in which the title character, an overweight average man called Avery Mann can absorb superpowers from the characters of comic books he touches. The comic becomes an instant hit, and many Hollywood studios become interested in making it into a movie. Comic Book Guy agrees to let Everyman become a movie, but only if he can pick the star. When Comic Book Guy sees Homer, he considers Homer would be perfect for the role, as he wants Everyman to be played by a middle-aged fat man like his character. But the studio executives realizes that audiences want a physically fit actor for the role, so that people will see the everyman they 'want' to be rather than the everyman they are. So they hire celebrity fitness trainer Lyle McCarthy to make Homer fit. After a month, Homer becomes fit and muscular, so the movie begins production. Soon afterwards, however, McCarthy leaves Homer for another client.Without McCarthy to keep him fit, Homer starts eating again and gains all the weight back. Homer can no longer fit into his costume or even his trailer, and the movie begins to go over budget. The studio executives and Comic Book Guy worry that the film will not be successful. The final version of the movie features scenes with the fat Homer and the physically fit Homer merged together, upsetting the audience. After the premier of the film, McCarthy returns and offers to make Homer physically fit again, which Homer accepts. The studio executives offer to let Comic Book Guy direct the sequel, on the condition that Comic Book Guy lie to the fans and say he liked the film. Comic Book Guy rejects the offer and openly criticizes the movie online. 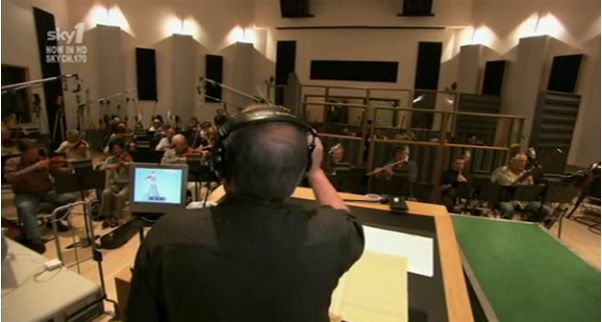 Alf Clausen composing for this episode. Seth Rogen and Evan Goldberg, writers of the film Superbad, asked the producers of The Simpsons if they could write an episode. They were invited to the writers room where they pitched several episode ideas. One was accepted, and they wrote an outline with the help of some feedback from the regular writers. The table read took place in August 2008, and production on the episode began soon after that. Rogen later said "we sat down for a read-through and three hours later I'm in a studio improv-ing with Homer Simpson, it was the single greatest day of my life." The writers tried not to repeat the plot from "Radioactive Man". Instead, they based the episode on the fact that almost every comic book has been turned into a movie. "Homer the Whopper" was watched in 8.31 million homes and acquired a 4.3 Nielsen rating/12% share. The episode received positive to mixed reviews. Robert Canning of IGN was positive about "Homer the Whopper", giving it a 8.6/10 rating. He commented that the first act of the episode was the strongest, while the others were weaker. Canning believed the reason for this was that the viewers have already seen Homer "struggle with his weight countless times, and Rogen's trainer, though funny much of the time, will likely never be remembered as a classic guest role." He added, however, that Rogen and Goldberg are able to find "a few new angles with the weight jokes, so it's not a complete loss." Overall, Canning thought "Homer the Whopper" was a good start to the twenty-first season, and although the plot may not be very original, the writers added "freshness to the proceedings. ↑ Liam Burke (2008-04-30). From Superbad To Superheroes - Evan Goldberg on Hornet and The Boys. Empire. Retrieved on 2008-04-30. ↑ Jami Philbrick (2008-07-26). "Superbad" writers Rogen and Goldberg to pen episode of "The Simpsons". Comic Book Resources. Retrieved on 2008-08-01. ↑ Evan Fanning (2008-09-14). Why Seth Rogen is on a high. Irish Independent. Retrieved on 2008-09-17. Modified on July 16, 2017, at 02:11.